Everything was perfect, from the decorations, to my husbands suit, to my dress & make-up and finally my hair. You may or may not know this, but I have natural afro hair, always have and always will. I’m not one of those; new age natural hair extremists, I don’t take much note of hair types i.e. Type 4a/4b/4c (this doesn’t mean its not important or useful information) nor am I a ‘transitioner’. I’m just me, a young lady that has always been natural, so I instinctively know what to do & what not to do with & to my hair. I have never permed or chemically enhanced my hair -ever. 1) Thank my mum for not taking it upon herself to perm my hair. 2) Thank myself for not deciding to perm my hair. 3) Thank those in the past that encouraged me to keep my hair natural! I’m not going to lie, having natural hair does come with its difficulties, one of these (for me) was deciding what style to do for my wedding. I noticed that some people revert to finding a way to straighten it, with hot combs or straighteners, others cover it up in weave, a few do braids and extensions, whilst others rock a fro. I decided to #KeepItNatural! 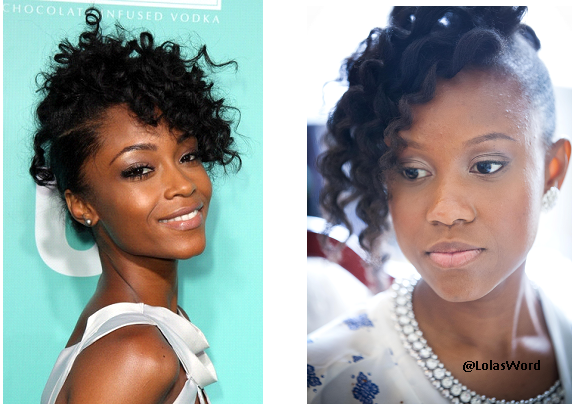 I wanted a style that emphasised curls, something different to my usual twist out and so I came accross a picture of Yaya DaCosta, American Actress & Fashion Model and thought, BINGO! It looked as though she had straightened her hair & then used a curling iron to achive her curls & then styled it. However I wanted minimal heat usage & damage, so my stylist for the day blow dried my hair out, not to the straightest, but just so we had length, then she tied the back into a doughnut bun and left some hair out in the front. The curls in the front were acheived with a curling wand and I had several diamante hair pins placed around my doughnut bun for finishing touches. I was and I am really happy with the way my bridal hair style turned out, I personally wanted to stay true to myself, I wanted a style I felt comfortable in/with, something that was me, that I could do again. I had many people suggest I do my hair in weave, yet I’m not one for extreme change and to be honest I wanted to look back at my pictures and recognise that its me. So I just want to encourage those of you who have natural hair & even those that don’t, to keep things simple, do what you want to do – if there’s a will there’s a way! I hope you are encouraged to #KeepItNatural when it comes to your wedding or just generally. Stay tuned for further Posts on: My Bridesmaids hair styles, Afro/Natural Hair Types, Natural Hair styles & products and Info on Married Life thus far! I can relate with this….